Part 3 of Extreme Cold Adaptation in Humans. So we’ve covered a lot of the features of cold adaptation. One major factor of habituation is left, and it’s key. Let me quote directly from Makinen. All subsequent italicized sections are direct quotations: “Young  postulates that the type of cold adaptation response is dependent on the amount of cooling of the body ”. This is what we realise though. Habituation is about the initial immersion process for us. This is saying that the overall perceived pain of the immersion process lessens. This was, for me, the missing piece of information. It explains for example why this winter I could get into 5 C water with little discomfort. I now have, to use the terminology, blunted response to cold. My gasp reflex is almost gone, my heart rate stays pretty normal prior to getting in, and even as I get in. I’ve mentioned in other posts this winter that this year I am better than I was last year, and last year I was better than the year before. And the paper agrees: “The initial response to immersion to cold water involves a “cold chock” (sic) response associated with hyperventilation, tachycardia and a reduced breath holding time”. Now the paper does say that this doesn’t seem important to extended exposure. Nevertheless, it seems to me that the more comfortable you are initially, that would translate into a certain extension of duration ability. A very important point that tangentially validates some of what we say, (and I think I said in previous posts): “Furthermore, habituation to cold (five immersions for 2.5 min in 12°C water) increases breath holding time, and was not augmented by psychological training”. So it’s purely physiological. Psyching-up routines are unnecessary (though personally I do like to take a few seconds of seeking calm before entry), but the important part there is the five immersions. Continuing: “It has also been demonstrated that repeated immersions in cold water result in a long-lasting (7-14 months) reduction in the magnitude of the cold shock response. The precise pathways and mechanisms behind habituation are not well understood, but could occur at the spinal cord or the higher centres of [the Central Nervous System]”. This is completely at odds with what I said earlier, and what we swimmers believe to be true, that losing the hardening process happens four to five times quicker than actual hardening. It could be that many us of don’t want to experiment in this area by losing all the hard work. Insulative and metabolic-insulative physiological adaptations occur “when repeated exposures to cold cause significant heat loss. Insulative adaptation to cold is believed to develop when [metabolic heat production] is insufficient to prevent cooling of the core”. “Very brief repeated whole body immersions (20 s) to cold water (0-2°C) causes habituation of thermal sensation and comfort already after the first exposure “. So habituation improves immediately. I had put this down partly (and obviously incorrectly) to a partly psychological knowledge that well, it didn’t kill me the first time. 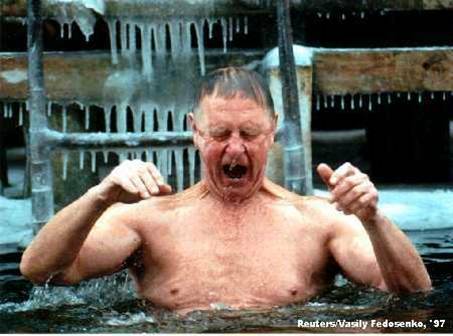 “Winter swimming results in a suppressed [metabolic heat production] and heart rate in response to cold . […] Regular winter swimming also attenuates the catecholamine response to cold water […] A follow-up study of winter swimmers over the swimming season observed a decreased BP and catecholamine responses in the end of the winter. “Whole-body immersion of longer durations (90 min to 3 h) into cold water (10-18°C) causes insulative or metabolic insulative acclimation ”. It goes on “Bittel  detected similar thermal responses, but also an enhanced [metabolic heat production] after the acclimation, suggesting metabolic acclimation”. Continue to Part 4 of Extreme Cold Adaptation in Humans. This is fascinating and extremely useful. Thank you for summarizing all of this research in one place. When Lynne Cox was being studied, the researchers were at the beginning of their understanding of hypothermia. They had trouble finding volunteers for their experiments because nobody wanted to get into the cold tank. Cold water swimmers doing their own experiments add to the common understanding and make it easier for others to apply this knowledge to their training. This is great information to have. Fascinating. I’ve been looking for the science to explain some of our experiences cold water swimming. Thanks for sharing!